Ritorno a "Gli Occhi della Guerra: Reporter Day"
10/7/2010 Marjah, Helmand Province, Afghanistan. 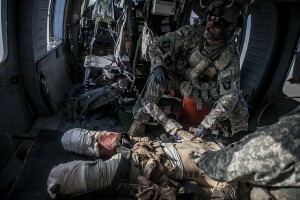 Flight Medic SGT Ian Bugh of Charlie Co. 6-101st prepares to treat Private Ivan Sears, 20, 2-16 USMC who lost both of his legs after stepping on a Taliban improvised explosive device, immediately after picking up the wounded marine from the point of injury in southern Marjah, Helmand Province. 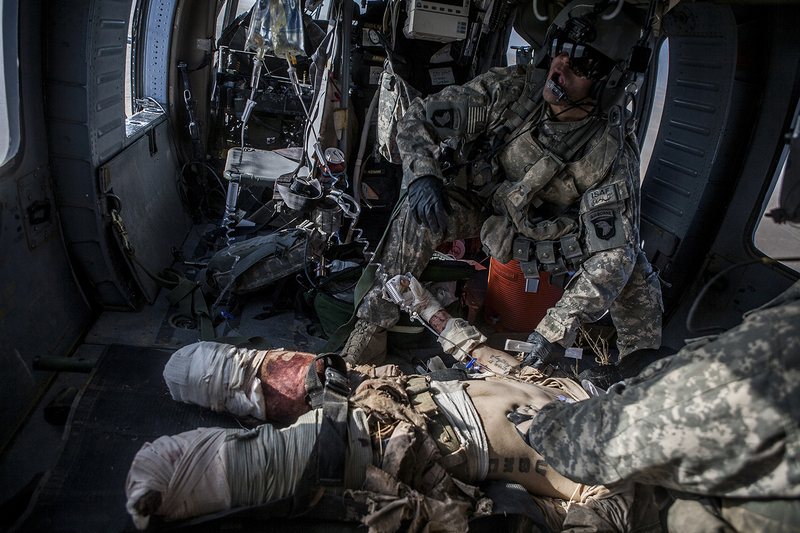 The Helicopter Medevac teams of Task Force Destiny, based at Forward Operating Base Dwyer in Afghanistan’s war-torn Helmand Province have a tough job. Servicing a large area that includes still restive southern Marjah, and much of the Helmand River Valley, TF Destiny answers the call to transport gravely wounded US Marines and Afghan civilians from the point of injury in the field to Role 3 trauma centers on bases in the area–often times landing under fire to extract Marines and soldiers that would otherwise succumb to their wounds. After the Medevac helicopter and it’s “chase” UH-60 Blackhawk companion aircraft get a call, they can be on the ground picking up a patient in as little as 20 minutes–delivering the fallen to a surgical theater within what flight medics refer to as “the golden hour”–or the hour after a catastrophic injury during which a patients transfer from basic battlefield triage care to a modern trauma surgical unit can mean the difference between life and death. .